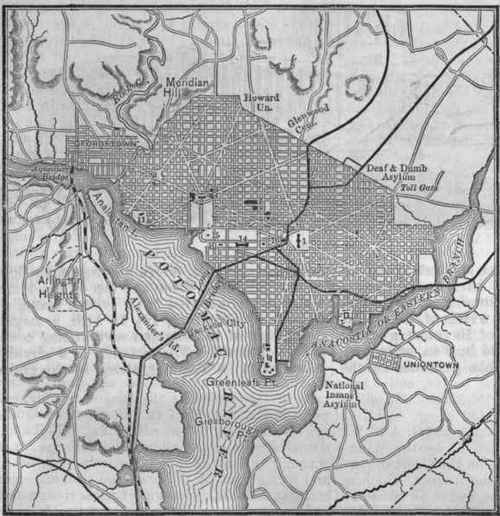 Washington, the capital of the United States of America, in the District of Columbia, on the left or N. E. bank of the Potomac river, 116½ m. above its mouth at Smith's point, and 184½ m. from the Atlantic at the mouth of Chesapeake bay, between the Anacostia or Eastern branch and rock creek (which separates it from Georgetown on the west), 35 m. (direct) S. W. of Baltimore, and 205 m. S. W. of New York; lat. (capitol) 38° 53'20'1" N., Ion. 77° 0' 27'9" W. of Greenwich; pop. in 1800, 3,210; 1810,8,208; 1820,13,247; 1830,18,826; 1840, 23,364; 1850,40,001; 1860,61,122; 1870,109,199, of whom 35,455 were colored and 13,757 foreigners, including 6,948 Irish, 4,133 Germans, and 1,235 English; in 1875, estimated at 133,000. The number of families in 1870 was 21,343; of dwellings, 19,545. The number of houses in 1875 was 23,121 (10,944 brick and 12,177 frame). It was incorporated as a city by an act of congress of May 3, 1802. By an act of Feb. 21, 1871, to take effect on June 1 of that year, the charter was repealed, but the territory formerly within the corporate limits continues to be known as the city of Washington. It is 14 m. in circuit, and covers a little more than 9½ sq. m.
The greatest length, from rock creek to the Eastern branch (W. N. W. to E. S. E.), is 4½ m.; greatest breadth, 3f m.; average dimensions, about 4 by 2½- m. The Potomac front measures 4 m., and that on the Eastern branch 3¼ m. The site covers an undulating tract having a mean altitude of about 40 ft. above the river. 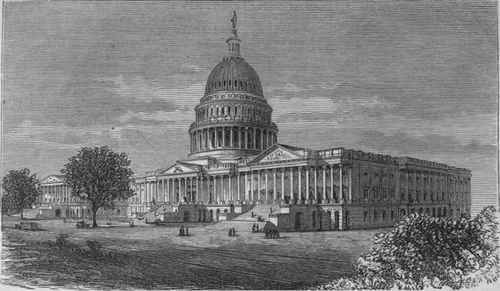 The elevation of the base of the capitol is 89½ ft.; of the highest point in the city, 103.7 ft. Beyond the limits is a circling range of wooded hills. The Tiber, a small stream emptying into the Potomac, runs through the city, but it is entirely built over, and forms part of the sewerage system. The streets, with the exception of those designated as avenues, are laid out at right angles, running due N. and S., and E. and W. The initial streets are North Capitol, South Capitol, and East Capitol with its prolongation W., which extend directly from the capitol in the directions indicated by their names. The streets running N. and S. are numbered from North and South Capitol streets, being known as 1st street E., 1st street AV., and so on, as they are E. Or W. of the capitol. The streets running E. and W. are lettered from East Capitol street and its prolongation, being known as A street N., A street S., and so on. East Capitol street is 160 ft. wide, and North and South Capitol streets are each 130 ft.; the width of the other streets varies from 70 to 160 ft. There are 21 avenues, named after states of the Union, crossing the streets diagonally, the principal of which radiate from the capitol, white house, or Lincoln square E. of the capitol. Of these 19 are from 120 to 160 ft. wide, and 2 are 85 ft. wide. These streets and avenues divide the city into 1,170 blocks or squares, many of which have been subdivided by streets or alleys from 40 to 65 ft. wide, variously named and not included in the original plan. Pennsylvania avenue, the great business thoroughfare, extending across the city from Rock creek to the Eastern branch, is interrupted by the capitol and the white house, between which it forms the main avenue of communication. Between these points it is 160 ft. wide, elsewhere 130 ft. Massachusetts avenue, N. E. of Pennsylvania avenue, is the handsomest in the city. It runs parallel with the latter, and is 160 ft. wide throughout. The city has an excellent system of sewerage, and since 1871 the streets and avenues have been greatly improved and beautified. They are well graded and paved, ornamented with a variety of shade trees, and well lighted with gas. There are several squares handsomely laid out and containing fountains, trees, and shrubbery. In Lafayette square, N. of the white house, is a bronze equestrian statue of Gen. Jackson by Clark Mills; in Judiciary square, a statue of Lincoln by Lot Flannery; and in Rawlins square, a heroic bronze statue of Gen. John A. Rawlins by J. Bailey. On April 14,1876, a colossal bronze statue of Lincoln by Thomas Ball, erected by contributions of colored people, was unveiled in Lincoln park. At the intersections of the principal avenues are spaces termed circles. Washington circle, at the intersection of Pennsylvania and New Hampshire avenues, contains an equestrian statue of Washington by Clark Mills; and an unnamed circle N. of the white house, a colossal bronze equestrian statue of Gen. Scott by II. K. Brown. At the intersections of the streets with the avenues are small spaces called triangles, many of which are ornamented. The mall extends from the capitol grounds W. to 15th street, between B street N. and B street S., taking the place of West Capitol street. It contains the botanic garden, the Smithsonian institution (see Smithsonian Institution), and the department of agriculture. The botanic garden, comprising 10 acres, is under the control of a committee of congress. The "park " extends W. from the mall to the banks of the Potomac, and contains the unfinished Washington monument and the government propagating garden and nursery. - The capitol is on the W. brow of a plateau that forms the E. portion of the city. The corner stone was laid by Washington, Sept. 18,1793, and the N. wing was ready for the first sitting of congress here, Nov. 17, 1800. The S. wing was finished in 1808, and the interior of both wings was burned by the British, Aug. 24, 1814. The reconstruction of the wings was begun in 1815, the foundation of the main building was laid March 24, 1818, and the whole was completed in 1827. An act passed Sept. 30, 1850, provided for the extension of the capitol. The corner stone of the extension was laid July 4, 1851, by President Fillmore, and an address delivered by Daniel Webster. It was finished in 1867. The whole edifice fronts the east. The old building, which now forms the centre, is 352 ft. 4 in. long and 121 ft. 6 in. deep, with a portico 160 ft. wide of 24 Corinthian columns on the east, and a projection of 83 ft. on the west, embracing a recessed portico of 10 coupled columns. The extension consists of two wings placed at the N. and S. ends of the central building, 44 ft. from it, with connecting corridors 56 ft. 8 in. wide, inclusive of their outside colonnades. Each wing is 142 ft. 8 in. in front on the east by 238 ft. 10 in. in depth, exclusive of the porticoes and steps. The porticoes fronting the east have each 22 monolithic fluted columns, and extend the entire width of the front, having central projections of 10 ft. 4 in. forming double porticoes in the centre, the width of the gable. There is also a portico of 10 columns on the W. end of each wing, 105 ft. 8 in. wide, projecting 10 ft. 6 in., and like porticoes on the N. side of the N. wing and S. side of the S. wing, with a width of 121 ft. 4 in. The entire length of the capitol is 751 ft. 4 in., and the greatest depth, including porticoes and steps, is 348 ft. The ground covered by the building, exclusive of courtyards, is 153,112 sq. ft., or a little over 3½ acres. The walls of the central building are of sandstone painted white; the extensions are of white marble slightly variegated with blue. Outwardly the capitol has various architectural adornments, with several groups of sculptures; within it is profusely decorated with frescoes, sculptures, and paintings. From the centre rises a cast-iron dome, 135½ ft. in diameter, to a height of 287½ ft. above the basement floor of the building. From the top of the dome, which is surmounted by a bronze statue of Liberty by Crawford, 19½ ft. high, a magnificent view of the city and surrounding country is obtained. The rotunda is a circular room 96 ft. in diameter, rising to the entire height of the interior of the dome, 180 ft. It contains a number of historical paintings by John Trumbull and others. The senate chamber, in the centre of the N. extension, is rectangular, 113 ft. 3 in. long, 80 ft. 3 in. wide, and 36 ft. high; it is surrounded by galleries capable of seating 1,200 persons. The hall of the house of representatives is in the centre of the S. extension, and is 139 ft. long, 93 ft. wide, and 36 ft. high, with a gallery seating 1,000. The hall formerly occupied by the senate, and now by the supreme court, is on the E. side of the N. wing of the central building, and is semicircular, 75 ft. long and 45 ft. high. The court of claims is in the basement of the W. extension of the central building. The old hall of representatives is in the S. wing of the central building, between the rotunda and the present hall of the house, and is the most stately and beautiful apartment in the whole edifice. It is semicircular, 96 ft. long and 57 ft. high, and is now used as the receptacle of the historical statues which congress in 1864 invited the states to contribute, each state to furnish two, and contains other statuary and paintings. The library of congress occupies a fine room 91 ft. 6 in. long, 34 ft. wide, and 38 ft. high, on the west of the rotunda, together with two wings, each 90 ft. 6 in. long, 29 ft. 6 in. wide, and 38 ft. high. The law branch of the library is in an apartment immediately below the supreme court room. The capitol grounds comprise 51½ acres, handsomely laid out and containing a great variety of trees. E. of the capitol is a colossal statue in marble of Washington, by Greenough. - The president's house or executive mansion is in the W. part of the city, 1½, m. from the capitol. It is two stories high, 170 ft. long, and 86 ft. deep, with a portico on the north supported on eight Ionic columns, and a semicircular colonnade on the south of six Ionic columns. It is of freestone, and is painted white, from which circumstance it is popularly known as the " white house." The corner stone was laid in 1792, and the edifice was occupied by President Adams in 1800. It was burned by the British in 1814. 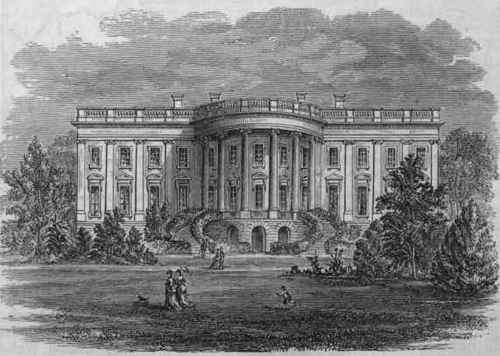 In 1815 congress authorized its restoration, and it was again occupied in 1818. The grounds lie between 15th and 17th streets, and extend to the Potomac, comprising about 75 acres, of which about 20 are enclosed as the president's private grounds, are handsomely laid out, and contain a fountain. 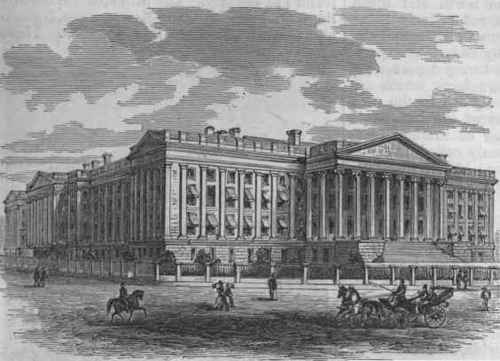 The treasury department, just E. of the white house, is a magnificent building in the Ionic style, 468 ft. long and 264 ft. wide, three stories high above the basement, with porticoed fronts on all four sides. The E. front is of Virginia freestone; the rest of the building is of Dix island granite. Immediately W. of the white house is a structure in course of erection intended for the accommodation of the state, war, and navy departments. It is of granite, in the Roman-Doric style, 471 ft. long and 253 ft. wide, or including projections and steps 567 by 342 ft., and 128 ft. high. It has four facades, those on the north and south and on the east and west respectively being counterparts. It was begun in 1871, and the S. portion was occupied by the state department in 1875. The war and navy departments still occupy plain brick structures, which are to be taken down to give place to the new building. The department of the interior is in a grand Doric building of marble, freestone, and granite, commonly called the patent office. It occupies two blocks, between 7th and 9th and F and G streets, in the central portion of the city, and is 453 ft. long and 331 ft. wide, including porticoes, and 75 ft. high. Besides the patent offices, the edifice contains the pension office, and the offices of public lands and Indian affairs. The most interesting feature is the very extensive collection of inventors' models. On the opposite side of F street is the general post office, a marble structure in the Corinthian style. It is.300 ft. long and 204 ft. wide, and consists of two stories with a rustic basement. Here are the office of the postmaster general, the dead letter office, and the city post office. 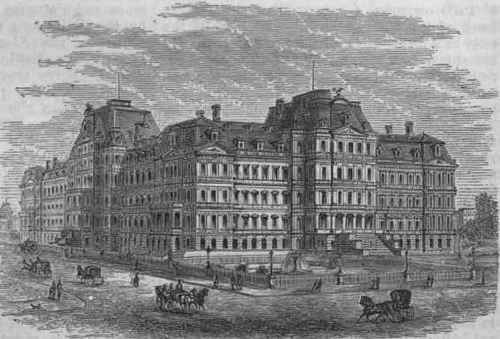 The department of agriculture occupies a renaissance building of brick and brown stone trimmings, 170 by 61 ft. and three stories high, besides basement and Mansard roof, situated between the Smithsonian institution and the Washington monument. It contains a museum, and has extensive greenhouses. The grounds are handsomely laid out, and contain a great variety of trees and plants. The United States naval observatory (lat. 38° 53' 38-8", Ion. 77° 3' 1'8") occupies a commanding site on the bank of the Potomac in the W. part of the city, in a handsome enclosure of 19 acres. By act of congress the meridian of the observatory is adopted as the American meridian for all astronomical purposes, and the meridian of Greenwich is adopted for all nautical purposes. The department of justice, bureau of education, office of the geological survey of the territories, nautical almanac office, signal office, and coast survey office occupy rented buildings. The army medical museum, the ordnance museum, and the government printing office are noteworthy. The arsenal is at the extreme S. point of the city; the grounds comprise 45 acres, handsomely laid out. The navy yard is on the Anacostia, and contains 27 acres; near it are the marine barracks. The District court house is on Judiciary square; the new jail is in the E. part of the city. - Among the principal buildings not belonging to the government are the masonic temple, odd fellows' hall, and Lincoln hall, which contains the library and reading room of the young men's Christian association. The Corcoran art gallery occupies a fine building near the white house. It was conveyed to a board of trustees for the benefit of the public in 1869 by W. W. Corcoran, a Washington banker. 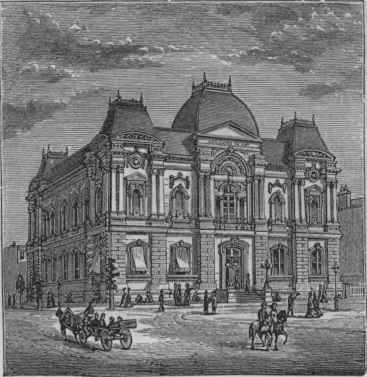 The principal theatres are Ford's opera house and the National theatre. The hotels of Washington are a prominent feature of the city. The principal are the Arlington, Ebbitt, Imperial, Metropolitan, National, St. James, St. Marc, and Willard's. There are five principal markets, of which three have fine buildings. There is a bridge across the Potomac, known as the "long" bridge, for railroad and ordinary travel. The Anacostia is spanned by three bridges (one for railroads only) and Rock creek by four. Horse cars run to every quarter of the city and to Georgetown. Communication with the north is furnished by the Baltimore and Ohio and Baltimore and Potomac railroads; with the west by the Baltimore and Ohio; and with the south by the Alexandria and Washington, which crosses the long bridge. There are two depots. Ferry steamers ply hourly to Alexandria, Va. - The prosperity of Washington depends upon the presence of the national government, and there is very little manufacturing or other business. The city contains five national banks, with an aggregate capital of $1,700,000, three savings banks, a safe deposit company, and 13 insurance companies (two life), with an aggregate capital of $2,650,000. The taxable value of real property in 1875 was $78,818,934, besides which there was about $21,000,000 worth exempt from taxation, not including the public buildings of the general government. The metropolitan police force has jurisdiction throughout the District of Columbia; the fire department is also coextensive with the District. Washington and Georgetown are supplied with water from the great falls of the Potomac above by an aqueduct 12 m. long, which discharges into a distributing reservoir 2 m. from Rock creek and 4½ m. from the capitol. It was begun in 1853 and completed in 1859, and has a capacity of 80,000,000 gallons a day. The distributing reservoir is capable of containing 300,000,000 gallons. From this point the water is conveyed to the cities in three great mains, having a capacity of 300,000,000 gallons a day. The present consumption is 23,000,000 gallons. Two miles above the distributing reservoir is a receiving reservoir, with a capacity of 163,000,000 gallons. Among the charitable institutions, many of which receive aid from the government, are the naval hospital and the Washington asylum, serving as an almshouse and workhouse for the District. The soldiers' home, 3 m. N. of the capitol and beyond the city limits, was established in 1851 for aged or disabled soldiers of the regular army. It occupies a beautiful site, and the grounds, comprising 500 acres, are handsomely laid out and contain several fine buildings. The District reform school for boys, established in 1866, with a farm of 150 acres, is N. E. of the city. The government hospital for the insane, with accommodations for 550 patients, is on the S. E. bank of the Anacostia. It was opened in 1855, and is designed for the insane of the army and navy and the indigent insane of the District of Columbia. The land appurtenant comprises 419 acres, of which 185 are enclosed by a wall. The Columbia institution for the deaf and dumb is on the N. E. border of the city, in a plot of 100 acres. The institution was chartered by congress in 1857, and is designed for deaf-mute children of the District of Columbia and those whose parents are in the army or navy. A collegiate department, the National deaf-mute college, was organized in 1864. This is the only deaf-mute college in the world, and is open to students from all parts of the country. - The public schools of Washington form part of the free school system of the District. Separate accommodations are provided for colored children. There are several fine school buildings. Map of Washington and Vicinity. 1. Capitol. 2. President's House. 8. Statue of Washington. 4. Treasury Department. 5. Corcoran Art Gallery. 6. State, War, and Navy Building. 7. Interior Department. 8. General Post Office. 9. Department of Justice. 10. Department of Agriculture. 11. Observatory. 12. Arsenal. 13. Navy Yard. 14. Smithsonian Institution. 15. Washington Monument. 16. Botanic Garden. New State, War, and Navy Building. The total expenditure for public school purposes amounted to $215,384 82; value of public school property, $910,687. The public schools for whites comprised one normal school and grammar, intermediate, secondary, and primary grades; those for colored children, a preparatory high school and grammar and primary grades. The private and denominational schools given in the table numbered 78, and included 13 night schools and 20 colored schools; besides these, which were for primary instruction, there were 28 academies, etc, for secondary instruction, with 1,454 pupils. In 1874 the public schools of the entire District were placed under the control of a board of 19 trustees, subordinate to whom are two superintendents, one having charge of the white schools of Washington and Georgetown and the white and colored schools outside of those cities, and the other of the colored schools of Washington and Georgetown. Howard university is near the N. border of the city, beyond the limits. (See Howard University.) Columbian university, just N. W. of the city, was incorporated as a college in 1821 and as a university in 1873. It is under the control of the Baptists. Its law and medical departments, the latter known as the National medical college, are in the city. In the collegiate department the degrees of bachelor of letters, of science, and of arts, and of master of arts, are conferred. A preparatory school is connected with it. In 1875-'6 there were 12 instructors and 103 preparatory and 48 collegiate students. Near the Columbian university is Wayland seminary, also under the control of the Baptists, established in 1865 for the education of colored preachers and teachers. It has academic, normal, and theological departments. Gonzaga college, on I street N. of the capitol, is under the control of the Jesuits. It was formerly known as Washington seminary, and was incorporated under its present name in 1858. In the city are also the law and medical departments of Georgetown college (see Georgetown), the National college of pharmacy (established in 1872), and the law department of the National university. The last is the only department organized of a proposed university incorporated in 1870. The congressional library contains (1876) more than 300,000 volumes; Washington library company and young men's Christian association, 15,000; odd fellows', 3,600; masonic, 2,328; Columbian university, 5,750; Gonzaga college, 10,000; Howard university, 8,000; National deaf-mute college, 1,700. The government departments and bureaus have libraries of from 1,500 to 40,000 volumes. Eight daily and eleven weekly (one German) newspapers are published, besides a number of periodicals. There are 117 churches and chapels, viz. : 30 Baptist (19 colored), 1 Campbellite, 1 Congregational, 15 Episcopal (1 colored), 1 Friends', 1 German Reformed, 2 Jewish, 8 Lutheran (1 colored), 10 Methodist (colored), 16 Methodist Episcopal, 1 Methodist Episcopal, South, 3 Methodist Protestant, 13 Presbyterian (1 colored), 1 Reformed Episcopal, 10 Roman Catholic (1 colored), 1 Swedenborgian, 1 Unitarian, 1 United Brethren in Christ, and 1 Universalist. - The permanent seat of the federal government was fixed on the Potomac by an act of congress passed July 16, 1790; in 1791 the site was selected by "Washington, and commissioners were appointed to lay out the city. The government was established here in 1800, congress assembling on Nov. 17. On Aug. 24, 1814, the British took possession of the city and burned the public buildings. Washington was under municipal government from 1802 to 1871, when a territorial government was organized for the entire District. This was abolished by the act of June 20, 1874, which placed the District under three commissioners appointed by the president with the consent of the senate. The apprehensions of an attack upon Washington had an important bearing upon military operations during a great part of the civil war. Slight works were begun before the city at an early date, and after the defeat at Bull Run these became formidable, and at times were strongly garrisoned. After Pope's defeat at the second battle of Bull Run, the Union army was concentrated behind the intrenchments at Washington, McOlellan being placed in command of all the troops in the vicinity of the capital. In July, 1864, Washington was left actually unguarded, and Lee ordered a sudden raid by which he hoped to induce Grant to withdraw so much of his force around Petersburg and Richmond as to involve at least a temporary raising of the siege. This operation was intrusted to Gen. Early, with about 12,000 men, who crossed the Potomac, and at Monocacy, on the 9th, defeated Gen. Wallace. On the morning of the 11th he was in front of Fort Stevens, almost in sight of Washington. Grant meanwhile had sent Gen. Wright with the 6th corps from Petersburg. On the 12th he attacked Early, who retreated during the night, and recrossed the Potomac. Washington, a borough and the county seat of Washington co., Pennsylvania, 31 m. S. W. of Pittsburgh by the Chartiers railroad; pop. in 1870, 3,571. It is connected by a branch of the Baltimore and Ohio railroad with Wheeling, W. Va. There are two iron founderies, a woollen factory, two coach factories, and various other manufactories a national bank, a savings bank, several schools, three weekly newspapers, and 11 churches, viz. : Baptist, Disciples', Episcopal, Lutheran, Methodist (3), Presbyterian (3), and Roman Catholic. Washington is the seat of Washington female seminary, and of Washington and Jefferson college (Presbyterian), formed in 1865 by the union of Jefferson and Washington colleges. It occupies fine grounds, on which commodious new buildings have been recently erected. It comprises preparatory and collegiate departments, the latter having classical and scientific courses. The libraries contain 8,000 volumes; the endowment amounts to $220,000. In 1875-'6 there were 10 instructors and 21 preparatory and 136 collegiate students. Jefferson college, at Canonsburg, Pa., was chartered in 1802, and grew out of the Canonsburg academy, opened in 1791. Washington college was chartered in 1806, and grew out of Washington academy, chartered in 1787 and opened in 1789. The number of graduates of Jefferson college is 1,890; of Washington college, 846; of Washington and Jefferson college (1876), 298.